The Stats To Know series continues with Nathan Jahnke, PFF’s Director of Analytics, finding an interesting piece of information about all 32 teams after 16 weeks of football. If you would like to make some observations of your own, you can do so with PFF Elite, where you can find several signature statistics for every offensive and defensive position in football, thanks to Premium Stats 2.0. Buffalo Bills: Since undrafted rookie cornerback Levi Wallace took over the starting outside cornerback job in Week 10, he has yet to allow more than two catches in a game. Those six straight games without allowing more than two catches is the longest active streak for cornerbacks. Miami Dolphins: Out of all second-year interior defenders with at least 20 tackles, Davon Godchaux has the lowest average depth of tackle at 1.5 yards. New England Patriots: J.C. Jackson has allowed 0.57 yards per coverage snap over the last seven weeks, which is third-lowest among cornerbacks who have played at least half of their team’s defensive snaps in that span. New York Jets: Since Week 10, Sam Darnold has an 80.7% adjusted completion percentage, which is the best rate for quarterbacks in that time. Baltimore Ravens: Marshal Yanda has allowed no pressure in seven games this season, which is tied for the most for offensive guards. Cincinnati Bengals: On plays where his quarterback has been under pressure, wide receiver Tyler Boyd has averaged 2.44 yards per route run, which is the second-best rate among wide receivers. Cleveland Browns: Only five offensive linemen have allowed two or fewer pressures in all 15 games this season. Three of them are Joel Bitonio, J.C. Tretter and Kevin Zeitler. Pittsburgh Steelers: Only two wide receivers in the league have 10 or more first downs on catches where the time to throw was 1.5 seconds or less. They are Antonio Brown (14) and JuJu Smith-Schuster (11). 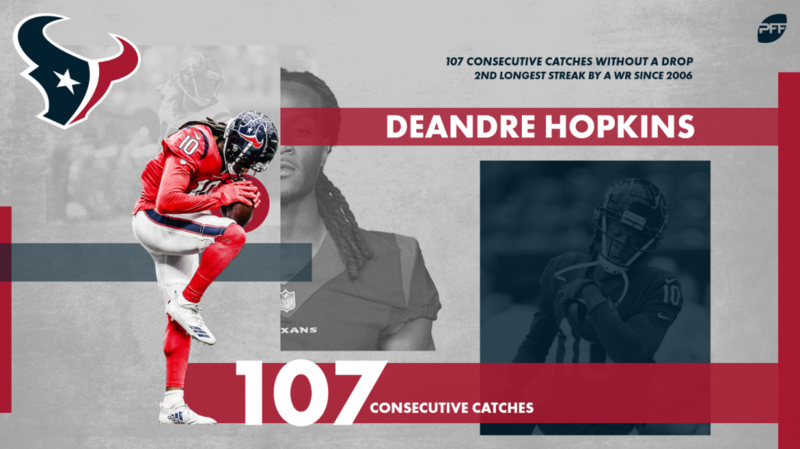 Houston Texans: DeAndre Hopkins has gone 107 consecutive catches without a drop. That is the longest active streak for a wide receiver and tied for the second-longest streak for a wide receiver in the past 13 years. Indianapolis Colts: Since Week 10, T.Y. Hilton has averaged 3.36 yards per route run, which is the most among wide receivers in that span. Jacksonville Jaguars: Tyler Shatley has gone 121 straight pass blocks without allowing a pressure, which is the longest active streak for all centers. Tennessee Titans: After Bobby Wanger missed a tackle this past week, interior defender Austin Johnson now owns the longest tackle or assist streak without a miss, at 60. In his three-year NFL career, he has yet to miss a tackle. Denver Broncos: Since Week 10, left tackle Garett Bolles has allowed pressure on 2.7% of his pass blocks, which is the third-best rate among left tackles in that span. 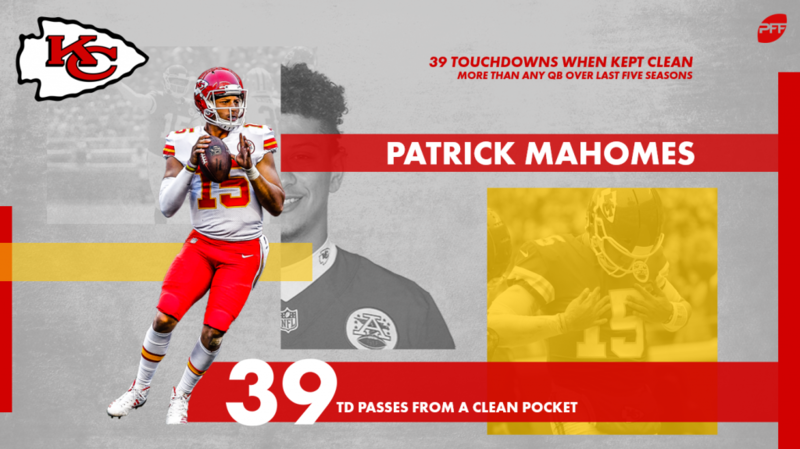 Kansas City Chiefs: Patrick Mahomes has thrown 39 touchdown passes from a clean pocket, which is five more than any quarterback has had in a season in the last five years. Los Angeles Chargers: Desmond King II has 20 stops on passing plays, which is the best mark among cornerbacks. Oakland Raiders: Jalen Richard has averaged 2.28 yards per route run this season, which is the second-best rate for running backs. Dallas Cowboys: Seven times this season, the Cowboys have had at least five men in the box with Leighton Vander Esch being one of the box players, and the opponent ran. Vander Esch produced a stop on five of those seven runs. The total number of stops as well as run stop percentage in that situation are both best in the league. New York Giants: Eli Manning has had a designed rollout on 50 of his pass attempts this season. On those passes, he’s had a league-leading 93.0% adjusted completion percentage. Philadelphia Eagles: Since Michael Bennett joined the NFL as an undrafted rookie in 2009, he’s had 527 regular season pressures. Only Cameron Wake and Von Miller have more pressures in the last decade. Washington Redskins: Since Week 10, Matt Ioannidis has gotten pressure on 16.1% of his pass rushes, which is the third-highest rate among interior defenders. Chicago Bears: On passes where the time to throw is 2.6 seconds or more, Kyle Fuller has nine forced incompletions, which are the most for all cornerbacks. Detroit Lions: On blitzes, Jarrad Davis has a pressure percentage of 30.6%, which is the best rate for all defenders. 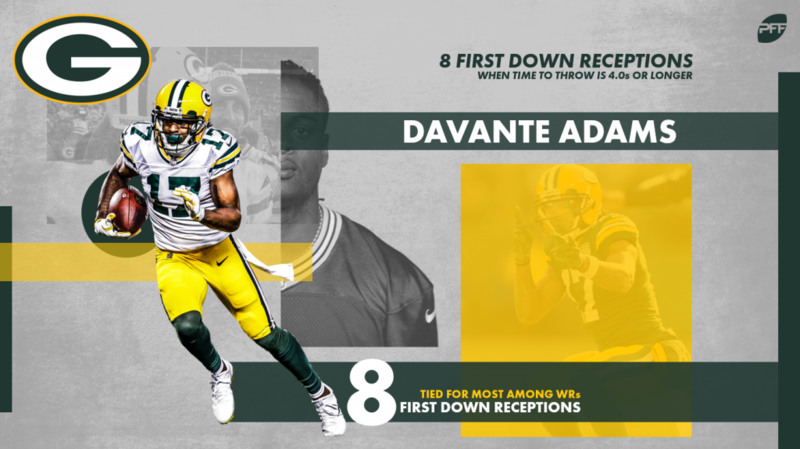 Green Bay Packers: Davante Adams has eight first downs on plays where the time to throw was 4 seconds or more, which is tied for the most among wide receivers. Minnesota Vikings: In five of the last six games, slot cornerback Mackensie Alexander has allowed 10 or fewer passing yards while playing at least half of the defensive snaps each game. Atlanta Falcons: When there are six or fewer defenders in the box, Tevin Coleman has run for a touchdown or first down on 50% of his rushing attempts since Week 10, which is the best rate for all running backs in that span. Carolina Panthers: Over the last six seasons combined, Luke Kuechly has 146 stops in coverage, and Thomas Davis has 139. That is the most and second-most among linebackers in that time. New Orleans Saints: Cameron Jordan has four or more pressures in six straight games, which is the longest active streak among all defensive players. Tampa Bay Buccaneers: Right tackle Demar Dotson has allowed pressure on 3.7% of his pass blocks this season, which is second-best among right tackles with at least 150 pass blocks. Arizona Cardinals: The Cardinals have only had one rookie play on defense so far this season; undrafted linebacker Zeke Turner (18 snaps). They will be the only team in the last six seasons to have fewer than 100 defensive snaps played by first-year players. 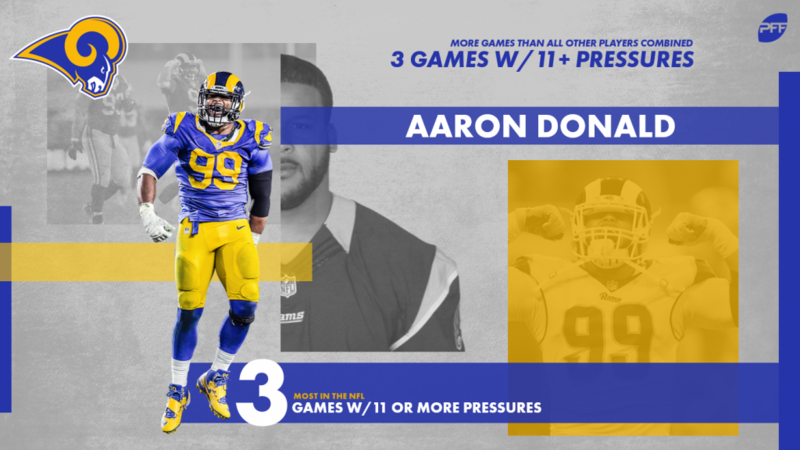 Los Angeles Rams: Aaron Donald has three games this season where he’s had 11 or more pressures. That is more games than the rest of the players in the NFL combined. Only Brandon Graham and Jerry Hughes have one each. San Francisco 49ers: When George Kittle lines up in line rather than in the slot, out wide or in the backfield, he has 837 receiving yards. That is more than any other player has had in a season this decade. Seattle Seahawks: Russell Wilson has 10 touchdowns while under pressure, which is the most for all quarterbacks, and is more than any quarterback had in 2017.